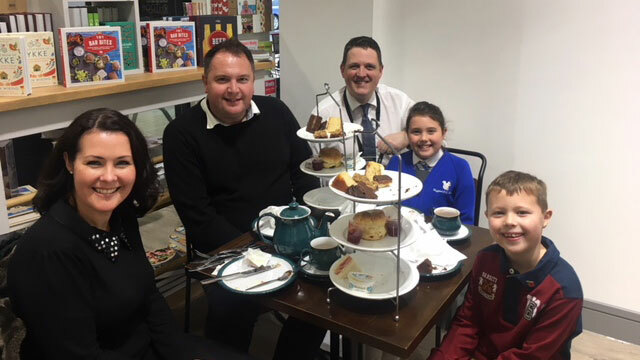 Pictured: Adela Fletcher (centre right) and her family enjoying afternoon tea with store manager Richard Ford (centre). A young girl’s Halloween idea for her local Booths store caught the attention of Edwin Booth, and her creativity was rewarded with afternoon tea plus a little slice of fame – the profile picture ‘logo’ on Booths’ Instagram, Facebook and Twitter has changed to her design. Adela Fletcher wrote to Edwin Booth, sharing her Halloween idea to transform the Burscough store’s illuminated sign from “Booths” to “Boo”. The idea caught the chairman’s attention and he wrote to Adela to express his thanks for her exciting idea. The practicalities proved too difficult at the store, so we chose to celebrate Adela’s idea through our social channels. The young girl behind the ‘Burscough Boo’ idea and her family, were invited to their local Burscough store’s cafe for an afternoon tea to thank Adela for her initiative. Whilst in store, the children viewed the sumo pumpkin on display in front of this year’s selection of pumpkins, ready for Halloween.